Today everyone knows the HP brand, but not everyone has the opportunity to learn news about logistics company. HP is a company trying to reduce each year the environmental impact of transporting its products around the world. Most of their software products and image are assembled in Asia. However, most HP sales are in Europe and America. 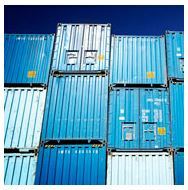 These products are normally transported by ship from Asia to distribution centers, and then to transport to their final destination, which is done by truck or rail. The company usually use air transport for urgent deliveries and when the products are lighter, such as cameras. Its logistics network uses fossil fuel for boats, trucks and airplanes. They know that these fuel emissions contribute to climate change and increase pollution, but can not measure these emissions because they use third parties to transport. However, its logistics program design for HP improves transport efficiency and reduces energy consumption. They also have new packaging and transportation of the product, as they are the subject of pallets and truck loading. In 2006 HP managed to reduce the environmental impact of transporting their products by the continuous transfer of air and maritime transport, and improving transportation planning and the use of pallets. They have made great achievements improving logistics shipments, but among these achievements include the pallets program they have, which is to introduce plastic pallets weighing less than a quarter of the wood and require less energy for transport shipments. In my previous post I mentioned the differences between the application of Lean in manufacturing and healthcare. However, which are the similarities? Moreover and perhaps more importantly: how to succeed implementing lean in healthcare? First, it is very important to achieve the management commitment, and we should start making them understand Lean in order to get their support because a manager’s most important task is to create an environment where interaction between team members leads to a high level of performance. In addition, it is important taking into consideration that lean is a learning method more than anything else, and learning cannot occur if basic stability has not been achieved. Second, the tools used for eliminating waste are similar in every type of organization, including healthcare. For instance, tools such “5 Whys” (used to discover the root cause of the problems), “5S” (used to create order and cleanliness, and to ensure that are maintenance day to day), “Kanban” (used to avoid the run out of supplies and to ensure that the oldest items are used first, eliminating waste due to expiration), “visual controls” (used to create a workplace where everything needed is displayed and immediately available) and “standardization” (used to identify and eliminate waste on processes, making the changes standard) can help any organization to implement Lean transformation. 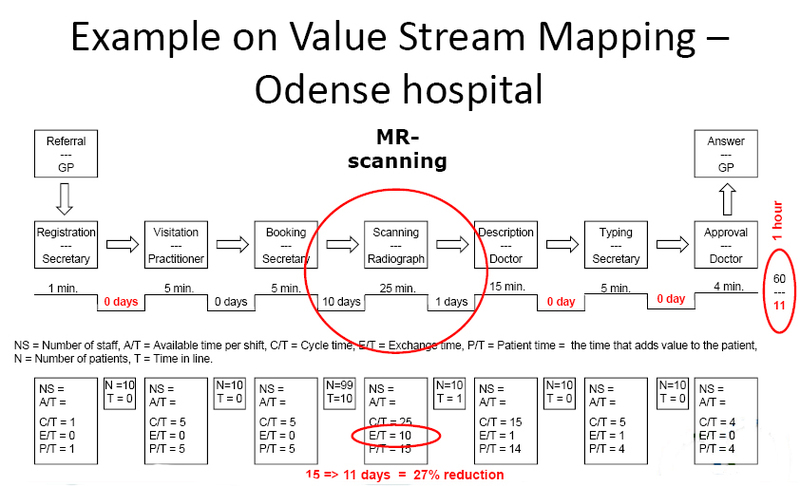 Furthermore, there are other tools like “Value Stream Map” (used to distinguish value-adding versus non-value-adding steps) that can be easily adapted to both health care operations and manufacturing processes. In order to succeed with Lean in the healthcare environment is important that people involved understand what Lean means first. The Key concept is value, which is defined as the capability to deliver exactly the product or service a customer wants with the minimal time. For that reason, people involvement and support for front-line staff to make improvements is very important. Some employees tend to resist imposed change, but most employees will be ready to make changes that will improve their own work and efficiency. Having achieved people involvement, the first step of the process is direct observation to understand what is going on the clinical area, to see how patients flow through the system and what obstacles and barriers are. Doing that we will understand what is truly valuable to patients, as well as establish whether or not what we are delivering is valuable. Keeping this in mind, a good way to start implementing Lean tools is using a Value Stream Map. VSMs are easily adapted to most healthcare operations and are designed to distinguish value-adding versus non-value adding steps. In healthcare, a value-adding step would be a nurse’s interview to obtain important information from the patient, whereas a non-value adding step would be a patient waiting for doctor to arrive at the examination room. Once discovered the wastes is time to eliminate them and improve the processes. As we said before, Lean proposes several tools for eliminating waste. However, it is very important to underline that continuous improvement is needed in Lean and continued adoption and application of the tools will lead Lean becoming a standard way of solving problems. Implementing lean is a difficult task. Perseverance, high quality leadership, patience and dedicated professionals are needed. Scepticism and resistance will be high and success not guaranteed. However, Lean can really work in a healthcare environment and its application can improve quality, productivity and team working environment. Ballé, M. and Regnier, A. (2007), “Lean as a learning system in a hospital ward”, Leadership in Health Services, Vol. 20 No. 1, pp. 33-41. Fillingham, D. (2007), “Can lean save lives?” Leadership in Health Services, Vol. 20 No. 4, pp. 231-241. Jimmerson, C., Weber, D., and Sobek, D. (2005), “Reducing waste and errors: Piloting Lean Principles at IHC”, Journal on Quality and Safety, Vol. 31 No. 5, pp. 249-257. Joosten, T., Bongers, I., and Janssen, R. (2009), “Application of lean thinking to health care: issues and observations”, International Journal for Quality in Health Care, Vol. 21 No. 5, pp. 341-347. Zidel, T. G. (2006), “A Lean Toolbox: Using Lean Principles and Techniques in Healthcare”, Journal for Healthcare Quality Web Exclusive, Vol. 28 No. 1, pp. 1-7. Implement Lean in a healthcare environment is a difficult task. Its application often leads to resistance and the common arguments are (among others) that a manufacturing approach cannot work in a hospital setting, that the personnel are too busy to implement lean, or that business approaches neglect the sociotechnical aspects of health care. Many people are reluctant to view the work they have been performing for many years as wasteful and according to that, they become defensive and resist any effort to change the situation. However, several experiences have demonstrated that techniques developed in manufacturing really work in hospitals and the potential gains of Lean application are enormous. Bolton Hospitals NHS is one of these experiences: before Lean implementation the hospital had a financial deficit and significant problems with long waits for diagnostics and treatments, after three years of Lean application, the financial balance was restored and the waiting times reduced. Lean can improve safety, improve staff morale and reduce costs, but some differences between the application of Lean in manufacturing and healthcare have to be taken into consideration. First of all, healthcare professionals deal with a group of customers who are often weak, vulnerable and frightened and in addition, the degree of organizational complexity is high and many procedures have a significant level of risk. Due to that, the outcomes of mistakes (drug errors, infections or misdiagnoses, among others) are often more critical than in manufacturing companies. Moreover, the patients consider as truly valuable aspects such as pain relief, wish for information, cleanliness or hygiene which are completely different of the value consideration in manufacturing. Second, the balance between achieving high quality and remaining financially viable is becoming a major issue for hospitals today. If hospitals were like most companies, they could compensate the rising costs increasing the selling price; nonetheless hospitals are not like most companies. According to that, the goal is to understand that good quality can cost less not more. In addition, setting delivering benefit in a healthcare environment is one of the most difficult tasks and it is important to define whether it is reduction of mortality, improvements in productivity or patient satisfaction increase. In health care, different actors have different views of value and for instance, the doctor’s clinical value oftentimes differs of the manager’s operational value. Finally, how processes should ideally work is often described in manufacturing companies, but it is rarely described in health care operations. This creates inconsistency in care, unpredictable delivery systems, and constant caregiver interruptions which in turn create inefficiencies, higher operating costs, errors increasing and worker frustration. In addition, different hospitals units may require different approaches to implementation. Whereas laboratory, pharmacy and information staff are normally process-focused; nursing units and senior leaders experiment greater difficulty in that aspect. Having examined the differences, in my next post I will consider the similitudes between the application of Lean in manufacturing and healthcare. When I was younger I went to PortAventura, you had to prepare seeing the map and choosing a route to be followed, before arriving there and even you were at the park you couldn’t know in a certain way, with your map in your hands, if you were going in the choice direction. Another important thing is that, you could lose your valuable time waiting to access to a ride. They don’t provide any method to get an idea how much time are you going to spend waiting in a crowd people ride or even the lack of indications to arrive at your preferred ride. A few days before, I have been in PortAventura, I saw some improvements that allow customers improving the access to the rides. For example they put more information and directions indicating where you are or which are your nearest attractions. Also, they provide different tickets with their relative prices to have a fast access. But, the most important thing that attracted my attention, even I have taken a photo to post here, it was the panels indicating how much time you are going to spend waiting to access to the main rides. In this image we could see what I am referring. It is necessary to highlight that people are concerned about the time because they want the maximum benefit of the day. 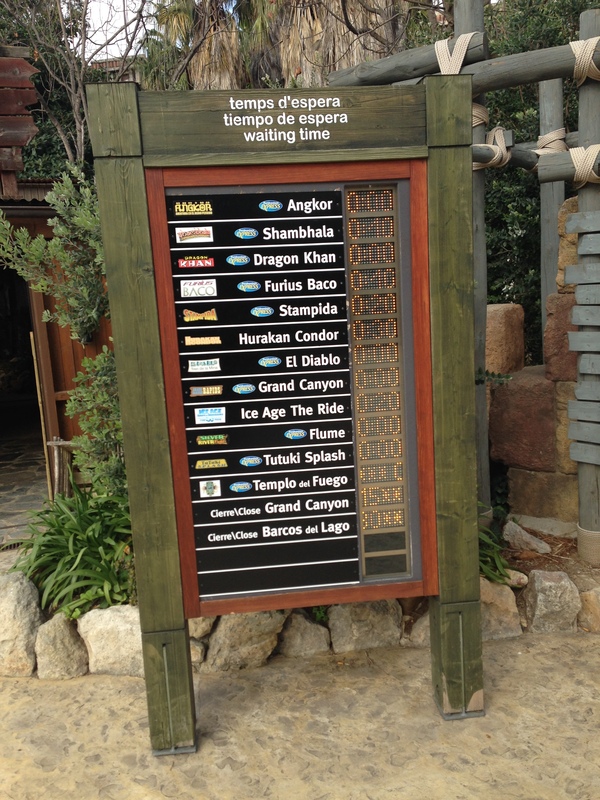 PortAventura provided another useful organizational tool to give an idea how much time is needed to enjoy each attraction. Due to logistics of the whole amusement park you can enjoy a day, because they have thought to improve their process applying some continuous improvements in their installations, even if you don’t really realize on it. The PortAventura managers will have been in the Gemba, applying the kaizen methodology to directly improve their flows people in their facility. Fast Fashion Takes Logistics to Another Level! The first time that classmates in America heard the name Zara was not because they saw an advertisement on the newspaper or a store on the street, it was because our next case project was the Zara case. In a class of logistics, transportation and supply chain management is almost a must to study this case, maybe fashion is not as interesting for eveyone, usually they may think that Valentino or Vera Wang are the neighbor’s children, but perhaps we should become familiar with the supply chain management style in Fast Fashion. Cloting retailers like Zara, H&M, Topshop and Forever 21 are giving a new perspective in the supply chaing and logistics world, maybe the improvements are in a business segment that sadly is not considered innteresting and important for everyone, because there is a lot to learn as the fast fashion industry is succesfully growing. Before fast fashion, the designers of this industry aimed from the haute couture market to lines sold in stores like Kohl’s and Walmart, historically they have worked on a four season product calendar. New designs were created six months before their arrival in stores, this gave designers time to make late adjustments according to any unexpected trend, and gave supply chain managers time to negotiate supply, production and transportation contracts. At the end, garments were sent to stores in a variaty of sizes and ranges. Then stores push the new arrivals extremely before, which eventually caused the discount in the items to accomplish the end of the season at the time desired. Fast Fashion has speed up the process, as the four season product calendar is almost ignored and there is a continuous design process, that of course is season conscious but more focused in real time trends, as they take into account more the demand signals received from store by the shoppers, or street style. For example if in certain location the customers express their interest in buying plaid shirts or denim skirt the information is transmitted by the stores to the central management areas, whom at the same thime contact the designers to inmediately design something to meet the demands, they make different changes but with the same idea in order to reach more customers, insted of six months to desing, produce and deliver a garment to store, fast fashion does the cycle in six to eighr weeks. To achieve this, retailers have a strong relationship with suppliers of materials and garment producers, whose at the same time prepare themselves with strategies, like buying materials in bulk and white, as white is easily dye into another color. Fast fashion companies ship small numbers of each item to their stores, as the goal is to sell the products at a full price, they are not interested in leaving garments to be sold at discount. But also the full price in fast fashion usually is below 50$ for some garments, which is a big difference from a haute couture garment that can cost 1000$. Fast fashion expects to succed based in the current trends and affordable prices, not exactly in quality, as they usually do not survive several years, in some cases months, but that is not a problem, as this mean an opportunity to sell in the future. This tipe of supply chain management is not possible to do in all industries, as not every item can be easily disposed in a short-term, but some ideas can be taken as they meet demands in a short period at affordable price, as this style has the potential to increase revenues and sales, as it increase the ability to sell the merchandise at a full price. Nowadays Lean is everywhere, Lean Management, Lean Construction, Lean Manufacturing, Lean Organization, but what is Lean? The main idea of lean is to increase value for the customer, through reducing waste. It creates more value for customers with fewer resources. The word Lean was first used to describe Toyota’s way of manufacturing. A Lean organization is one that understands the customer value and focuses key processes to increase this value. The main goal is to give a perfect value, through a perfect value process with zero waste. To accomplish the main goal, lean thinking focus in optimizing the flow of product and services through entire value streams that flow horizontally across technologies, assets and departments to customers, contrary to the usual management focus of optimizing separate technologies, assets and vertical departments. Eliminate the waste of entire value streams, instead of single points, create better processes that need less human intervention and effort, less space, capital and time to create products and services at less costs and fewer defects, compared with traditional systems. Also companies are able to respond faster to the customer changes, this with high quality and low cost and better times. Management’s information also flows simpler and accuratly. Lean is applicable to every business and process, is not just a tactic to reduce costs, and is a way of thinking and acting in the companies. Lean is not a temporal program that causes short-term reductions, companies transform themselves in the process to become Lean. Lean is not just a trend, is here to stay as long as the companies are determined to give a perfect value with fewer resources. Pillar What Is It? How Does It Help? Autonomous Maintenance Places responsibility for routine maintenance, such as cleaning, lubricating, and inspection, in the hands of operators. Gives operators greater “ownership” of their equipment. Planned Maintenance Schedules maintenance tasks based on predicted and/or measured failure rates. Significantly reduces instances of unplanned down time. Quality Maintenance Design error detection and prevention into production processes. Apply root cause analysis to eliminate recurring sources of quality defects. Specifically targets quality issues with improvement projects focused on removing root sources of defects. Focused Improvement Have small groups of employees work together proactively to achieve regular, incremental improvements in equipment operation. Recurring problems are identified and resolved by cross-functional teams. Early Equipment Management Directs practical knowledge and understanding of manufacturing equipment gained through TPM towards improving the design of new equipment. New equipment reaches planned performance levels much faster due to fewer startup issues. Training and Education Fill in knowledge gaps necessary to achieve TPM goals. Applies to operators, maintenance personnel and managers. Operators develop skills to routinely maintain equipment and identify emerging problems. Safety, Health, Environment Maintain a safe and healthy working environment. Eliminates potential health and safety risks, resulting in a safer workplace. TPM in Administration Apply TPM techniques to administrative functions. Extends TPM benefits beyond the plant floor by addressing waste in administrative functions. As it was described in this blog, TPM is a method to improve and enhance productivity. TPM permanently improves the overall effectiveness of equipment, with the active involvement of operators.